Come and feel the excitement on our eight Treetop Adventure courses, more than 120 workshops accessible to ages 5 and up (green courses). On the bill: 2 xxl rope bridges, monkey bridges, climbing walls, Tarzan’s rope, peak surfing, 3 base jumps (jumping into the void), etc. When you are equipped with our Clic-it safety system, the Treetop Adventure at Explora Parc is 100% pleasure and 0% danger. There is no time limit, so you can enjoy our covered terrace while enjoying some refreshment, an ice cream or a picnic during your adventure. Starting at €10, open admission; reservations required for groups of 10 or more. Net course access for kids 3 and up. Would you like an introduction to archery, or to improve your technique? Take advantage of your holiday and register for introductory or advanced classes or training with a special setting. By reservation. 13 courts are available in the heart of the forest, clay, quick or resin, indoors or outdoors. Class and course reservations 02-51-59-18-30. 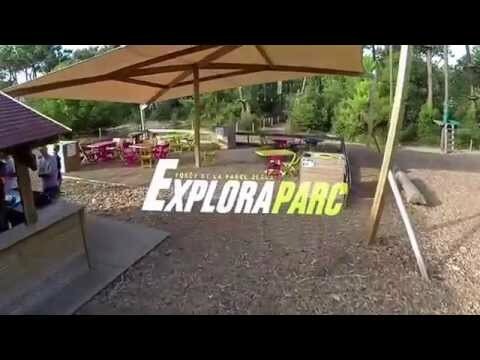 ARCHERY TAG : again at EXPLORA PARC ! Armed with a bow and completely harmless arrows, challenge your friends or complete strangers to epic jousts, paintball-style. Ages 9 and up, several types of games are yours to choose, with the most skilled archers winning, for truly fun times! By reservation. Tired of playing indoor laser games! From now on, your battlefield is the whole forest! Using a unique technology, Explora Parc features Laser Tag (outdoor laser game) to face off against your friends armed with revolutionary laser rifles.. A multitude of scenarios to choose from for the maximum fun, without bruises and paint! By reservation. Explora Parc is also about ... the orienteering course, geocaching, guided hikes from the Explora Parc departure point, the cabin trail, etc. A whole range of hikes to choose from to discover the forest; for young and old. Website "Explora Parc (treetop adventure course)"